I’m hired for a job at my friends’ fro-yo shop, but the building isn’t completed so I don’t know when I’ll start work (and the opening day has continued to be pushed out since November...). I’m currently unemployed with tons of time on my hands, yet I don’t have my own car so I can’t go places, can’t visit friends, am always cooped up at home. I was having a pity-party for myself one morning. But before devotions, I asked the LORD to help me regain my focus, regain my sight and direction and to give me a hunger for His Word that would never be quenched. Then I dove into reading through Romans and Psalms. What seemed liked a few minutes later, I looked at my phone to check the time, and wow. I had been having devotions for 3 hours. Three whole hours spent journaling, praying and reading the Bible! The time had flown by and yet I still felt that I hadn’t had enough. God had answered my prayer. Amidst my prayer of thanksgiving to my Father for allowing me so much uninterrupted time, I thought to myself: This is why I’m unemployed. This is why I’m single and uncommitted. This is why I don’t have a car. This is why I’m still at home. So that I can wholly focus on Him. One of my dearest friends and a woman I consider to be one of my role models, reminded me to take advantage of having so much free space in my days because in the future, it will most likely be cluttered with family, band stuff, and jobs. 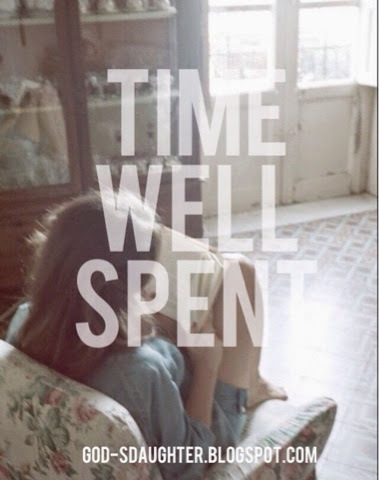 She encouraged me to make the most of it right now and to never sit and wonder what to do with my time because ‘as much time as I could spend with Jesus is time well spent’. So now it’s my turn to encourage any of my readers who are still at home, still not working, and who still have open schedules to grasp this time and invest in your relationship with the LORD. Allow Him to romance you in a quiet time. Never, for once, think that ‘just being at home reading your Bible’ is a portion of your day that you could be doing something else. Because I guarantee you, there is nothing more important that you can do than grow in your love with Him. Glad it was an encouragement. You're welcome! Thank you for the comment. This was very encouraging to me, thank you! Lately I've been letting myself get distracted and busy with other things, but this helped me to make a commitment to dig into His Word and study every. day. and reminded me how much I learn when I do! Not to mention that now is the time to study, because in the future when I have my own family to take care of, I won't always have the time for it then! Exactly. We must remember to not take for granted this time that we have on our hands, and to use it wisely. And what better way than to study and grow more in His Word? You're welcome! Thank you for the comment. haha trust me, I've been applying at every place that has told me to drop off an application or resume. Just because there's an Arby's near me doesn't mean they're hiring. It's hard to find a job in a small town like mine. Good reminder for everyone! If you ever have a spare moment or have some down time, spend it with the Lord! I understand how you feel. I have been graduated almost 2 years so I have had a lot of time on my hands (I don't have a job or car either). I know how easy it is to feel sorry for yourself and take the blessing of free time for granted. I fail often and grumble about how miserable my life is -- why won't someone just hire me?! Right now I'm trying to make the most of my time....I'm putting in a garden, finishing teaching my 6 yr old sister, and just trying to help my family. It is not easy, I know! I want my independence and freedom! I want to go off on my own adventures. I have big dreams (maybe too big, I sometimes think....). But His timing is perfect. His plan for my life is perfect. I am going to keep trusting that and holding onto that hope. i love this! it's so easy to talk about and so hard to do. but it is so rewarding. i need to keep reminding myself to make the best of my time, NOW.